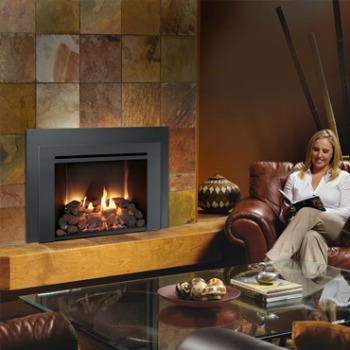 ​The FPX 616 GSR Insert | Large Fireplace Inserts showcase a fire that is 2nd to none. This gas insert has a big heat output with a glass size of 616 sq inches. 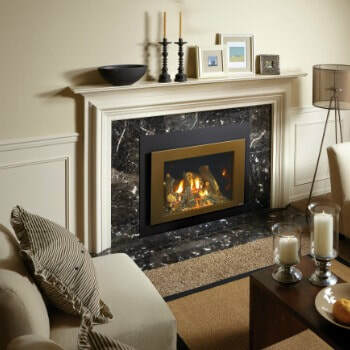 A conventional hearth look is achieved by having the ceramic glass go almost all the way to the bottom of the unit. This gas fireplace insert transforms an existing masonry or metal fireplace into an efficient heater while conserving the quaintness of a traditional fireplace. This unit can heat up to 2,000 square feet. The 616 comes full loaded, with fans, accent lights and Greensmart Remote, all standard. The standard accent lights beautifully illuminate the firebox. The Greensmart Comfort Control permits the middle and front burner to operate independently of the rear burner for maximum flame turn-down. *All measurements and colors are approximate. Contact your local Bare's Stove and Spa for details. Specifications may change without notice. Please note Bare's strives to update manuals and information as they become available. These are for reference only; the latest documentation by the manufacturer takes precedence. Please visit Bare's Stove and Spa for color options, dimensions and additional information. ​​​​​​​​​​​Would you like to see more options? This unit can be used with Lopi fireplace accessories and faces. Visit the following for more great options.